With global population growth is seems obvious that Santa Claus has had to introduce automated processes to the North Pole workshops. How else could he and his team cope with the sheer volume of gifts needing wrapped? However, at some point the Elves will surely begin to question the introduction of new machinery — it’s putting Elvish jobs at risk. What’s next in Santa’s never-ending quest for efficiency and cost-reduction? Outsourcing to cheap Penguin labour at the South Pole? 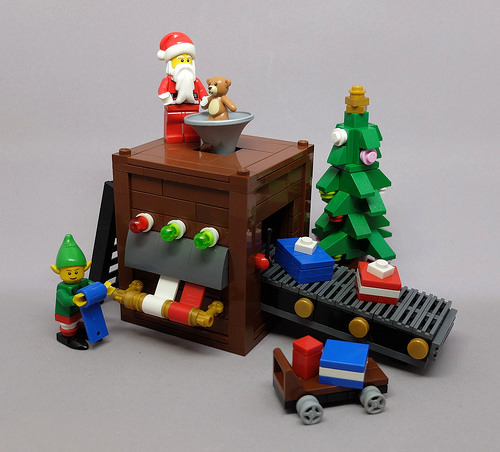 Every year I build a small LEGO display model as part of our decorations. This is 2016’s effort. I hope you enjoy it, and I hope you have a very happy Christmas.